Prizm Media Inc. CEO & Co-founder Zeeshan Hayat Featured in Canada's Podcast - Prizm Media Inc. Entrepreneurship began for CEO & Co-founder Zeeshan Hayat at the age of 22 in 2001, when him and his co-founder/wife Karina Hayat, decided to start an online business during college in Vancouver, British Columbia. Today, that business is Prizm Media Inc. – a healthcare technology firm that focuses on centralizing and accelerating processes for healthcare providers and patients, relating to medical products. The company has made an impact on the lives of over 18 million patients and serviced some of the fastest growing pharmacies and durable medical equipment providers in North America. 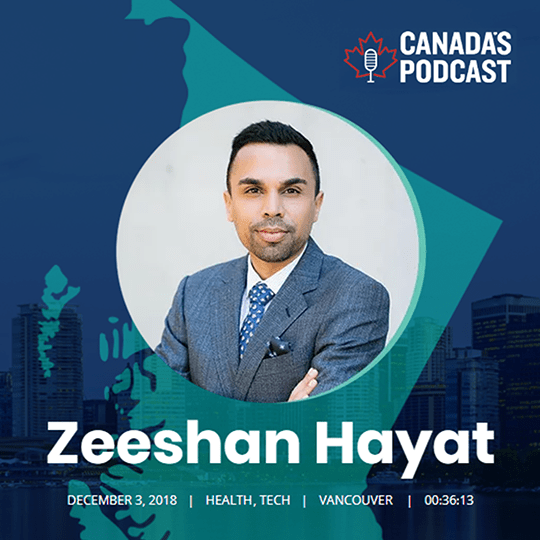 In this podcast, audiences in Vancouver and around the world will get an inside scoop about Hayat’s journey, philosophy, advice for entrepreneurs, and fun details about the man behind Prizm Media. 1:26 – Zeeshan Hayat & Prizm Media Inc.
17:00 – Are entrepreneurs wired differently? 21:20 – What kind of job would you not like to do? 21:53 – What is your favourite quote or sentence in business? 26:27 – What keeps you up at night? 30:48 – How long would you last on a tropical island?